Deliberately misrepresenting your views is a standard form of attack that will be leveled against you when you express the heretical belief that maybe the world’s not a ball. If you cite the lack of curvature they will point out that there’s no way it’s flat because the water would flow over the edge. Confronted with the eminent falsifiability of their beloved globe, they often retreat into denial, ignoring your facts and focusing instead upon some ridiculous facet of a Flat Earth model nobody takes seriously. This is a deliberate form of deflection which allows them to censor your message by conflating it with nonsense. You will never hear Joe Rogan (a controversial American talkshow host. ed ) say, “Someone please explain to me how the curvature is determined.” Nope. He’ll rant and rave about how the evil Flat Earthers need to be tied to stakes and burned. This is an intentional act of sabotage. Straw man arguments are meant to claim victory in a debate and change the subject. However, most of the time people employ this method unintentionally. It comes from a lack knowledge about the topic which, to be fair, is totally understandable. This article is intended to assist the Flat Earth Reformer in this regard. So usually when they come at you with strawman attacks it is because they are ignorant about the Flat Earth model and therefore they don’t actually know what they are arguing against. They don’t know the claims you make and so they can’t argue against those. Use strawman arguments as a chance to correct the record. Sometimes people are just responding to their conditioning. All of us went through the indoctrination process. We all went to elementary school where we were shown a globe and we were told people used to believe that if you kept sailing the same direction you would go over the edge, and then the kids would all laugh because that’s a laugh line. It’s a straw man mischaracterization of the Flat Earth that was handed to us when we were little, so obviously the first time someone encounters this topic as an adult they’re going to revert to what they know. “Wait a minute,” they’ll say, “everybody knows the world’s a ball. We figured that out five-thousand years ago. I was told about this in the second grade, so if you think the world is flat, then why hasn’t anyone gone over the edge?” Debate won. At least that’s how they see it. So that’s a fairly straightforward and logical comment, but what they miss here is that this is not what we think the Flat Earth looks like. We reject heliocentrism altogether so these distant stars you see, and the distant sun 93 million miles away, does not apply to any Flat Earth model. And to be clear, there are several competing models. There isn’t a consensus yet. Perhaps the enforcers of the globe-matrix have the ideal, accurately represented map of the Flat Earth but we certainly don’t. We do have common points of agreement, namely the lack of curvature and the eminent falsifiability of the globe, but we’re still seeking the best explanations. Unlike globers, we don’t pretend to know everything. The absence of consensus doesn’t invalidate it. Consensus has nothing to do with science. A new discovery by an individual may actually change what the majority believes. It’s not as though all discoveries are made by every scientist at the same time. New information by individual or minority opinion is always what upsets the status quo. Because there isn’t a fully agreed upon model, strawman arguments tend to fail anyway. They should always be met with some facet of the debate that is agreed upon, like the fact that there is no stellar parallax. Or that lakes are flat. It should also be mentioned that none of us believe in outer space and that the only time we have ever seen it is in the movies and in NASA computer animations. The crew on the International Space Station NEVER EVER EVER take a handheld camera and look around outside the window. We have to rely on their testimony that it’s “oh so beautiful.” Well, the reason why they can’t show us space is because it doesn’t exist, or at least not in the way it’s been described. The Flat Earth model rejects SPACE itself, which is what many people who are deeply indoctrinated into the spherical Earth model don’t get. They can’t think outside the Globe. We reject orbiting spheres, the vastly overstated distances to the stars, the moon, and the so called planets. We see the heliocentric system as a farcical model and recognize that “space” is as real and as provable as “Heaven.” We have to rely on priests and true believers who have crossed over to the other side. Of course this means that the curvature of the globe is occluding the view of those constellations on the other side of the hump. That explanation only makes sense if you’re looking at the stars and their distances through the lens of the heliocentric model. It’s a straw man argument because Flat Earth rejects the distances involved in the heliocentric model. If the stars are not trillions of miles away, but are instead just a few thousand miles away, than any constellation that you see from the northern “hemisphere” will not be visible a few thousand miles to the south because it will be over the visible horizon from the distant observer. Besides, It hasn’t even been established that light itself can been seen from 25 trillion light-years away. The existence of light-years and the entire cosmology predicated upon the existence of light-years has been called into question. Also note that the straw man argument also applies to the stereotype used to attack Flat Earthers when there aren’t any around. In the absence of a visible Flat Earth movement, the enemy will have free reign over the narrative. This is why people generalize about Flat Earthers. We’re described as a bunch of trolls who aren’t serious. Or we’re nutcase homeschoolers, dinosaur deniers, global warming deniers, who inhabit the shallow ends of our gene pools. The way we deconstruct that particular strawman, the misrepresentation of who and what Flat Earthers are, we have to be seen and heard. When a creep like Joe Rogan launches a strawman attack against all Flat Earthers, you can rest assured that we’re in the process of witnessing the gradual acceptance of a self-evident truth. First they ignore it, then they attack it, then they pretend to have known it all along. 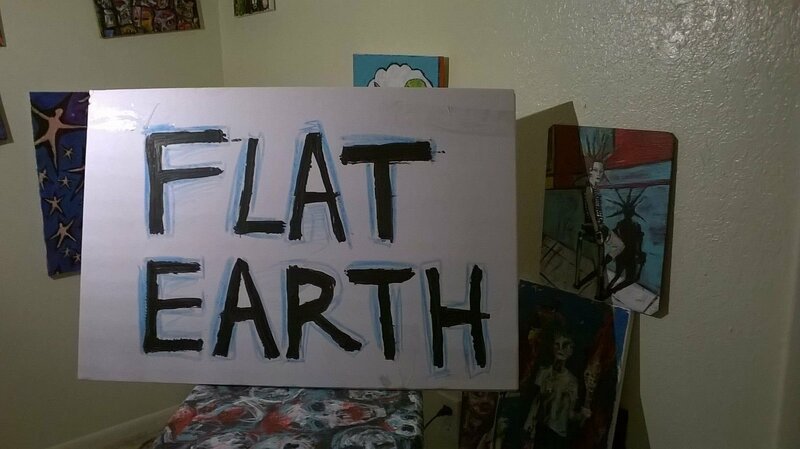 Call them out for “getting everything wrong,” and correct the misrepresentations of Flat Earth. Advocate for the truth. Be an agent of change as we deconstruct the Globe Paradigm. Become the visible vanguard of the Flat Earth Reformation. This will negate their attempts to define us.